For my train ride to Tokyo, I was issued with four identically sized tickets; one to take me down to Hakodate in the south of Hokkaido, one to bring me through the tunnel to Shin Aomori in Honshu and two for the Shinkansen bullet train to Tokyo. Standing in Shin Aomori station, I flexed the two card rectangles in my hand and wondered how the duplicate nature of this ride confirmation worked with the automatic ticket barriers. Presumably --I reasoned-- one ticket was a receipt or a seat reservation while the other would allow me to pass through the metal gates in full possession of my limbs. Experimentally, I inserted a likely looking ticket and stepped forward. This outrageous act produced a squeal of red lights and the appearance of an attendant to see what the stupid foreigner had done stall their efficient system. It transpired the required secret handshake involved inserting both tickets simultaneously, one on top of the other. To me, such an act should have resulted in a mechanical choking grind, the sound of shredding paper, and culmination with a flashing set of lights marked "DENIED" before ejection of what remained of both ticket and ticket owner. Instead, the machine sucked the paper through its body, stamped the bottom rectangle squarely across its front side and returned both in the exact position I had inserted them. Unnerved, I plucked the tickets from the barrier exit and hastened onto the platform. 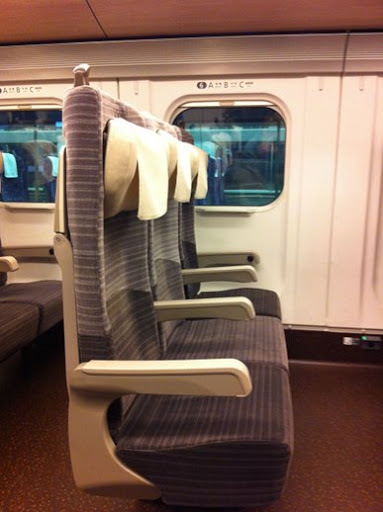 The Shinkansen carriages have a luxury air to them, with ample leg room for even the most spidery of foreigners and power sockets to charge your laptop or cell phone. The seats are also the most upright contraptions I've ever seen in my life. Mercifully, they recline to allow a position more suited to non-cyborgs. As its name suggests, the bullet train does not mess about. It had taken me 6 hours to travel the 260 miles from Sapporo to the top of Honshu. I did the remaining 450 miles to Tokyo in 3. Since it was now dark and I was jealous of my neighbour's bento box, I took a nap in my reclined chair, lifting my head only to squint at the lights of Sendai as we made a brief stop. Did I need a ticket to reach Shinjuku? In the "no" corner, we had the fact I had been spat out inside the subway gate, still armed with one ticket, from which there was nothing to stop me taking a train of my choice. At least, not until I tried to get out the other side. In the "yes" corner, there was the fact that the travel agent with whom I had booked this ticket seemed concerned regarding to which Tokyo station I wished to travel. Since we were battling with language, I told her Tokyo Station was fine and decided I'd easily work out a route to Shinjuku when I arrived. This confidence now seemed positively blaze. Since it wasn't immediately obvious how to buy a ticket from inside the barrier, I decided to postpone the moment of reckoning until I reached Shinjuku. Then there would always be an fantastical option of jumping the ticket barrier altogether and trying to disappear in a crowd of black-haired Asians. I walked across the station to the "chou line" and climbed up the stairs to the platform. The evening in Tokyo was its usual heaving self, and people pushed past each other to form lines ready for the next train. Over to one side of the platform, however, I noticed a crowd of people surrounding what looked like a ticket machine. This must be it! Those people were clearly all like me; they had magically found themselves on the other side of the ticket barrier without a ticket and were now trying to remedy this criminal act. I joined the queue and scanned the screen as I reached its front. According to the English guide, I could chose to travel to Shinjuku by 'semi-rapid' for 500 yen. I hesitated, decided it was better safe than sorry at this point in my journey, and bought the ticket. The guard looked at my ticket and nodded. "だいじょうぶです。" It's OK.
Ha! Who needs a communication class? After this promising statement, the guard beckoned and led me across to another guard who looked at my ticket, took it and then handed me back my 500 yen. I was then ushered onto the train. ....... OK, I need a communication class. This didn't make the slightest bit of sense. The train set off and arrived in Shinjuku about fifteen minutes later. Feeling dazed and confused, I stepped out into the station and decided to try my second Shinkansen ticket in the barrier. If it squealed, at least someone would come and rescue me and for an arrest, I bet they had to take me through the barrier. The ticket machine took my ticket. The gates swung open. I scuttled away into the Tokyo city. The night was still young and there were undoubtedly another 101 ways I could be confused before midnight.